And since school has recently started, I decided to use my felt collection to make some pencil pouches for my family. A friend of mine recently had a "School-Year's Eve" party with her kids the night before school started (such a cute idea that I think I'm going to try next year since school has already started here.) 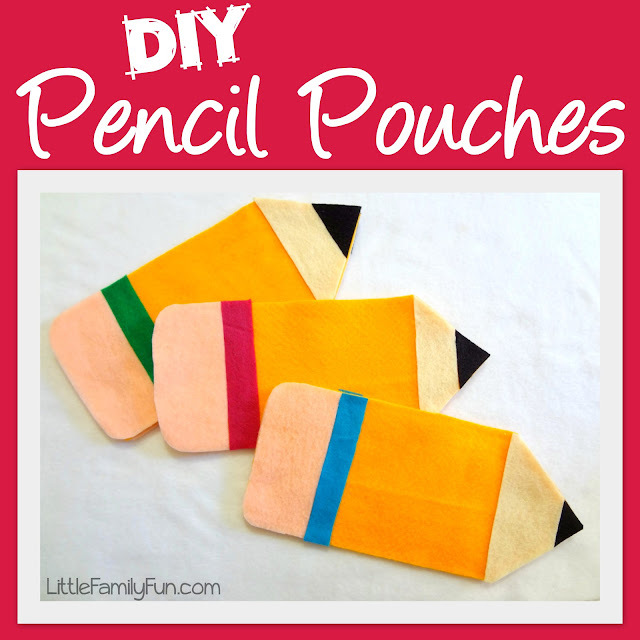 I had the idea to maybe use these pencil pouches each year to put surprises in on the night before school starts--kind of like Christmas Stockings!! First, cut out 2 rectangles out of orange or yellow felt. I cut mine appx. 11" x 4", but these can be any size you want! Next, get your fabric glue! Then trim the tip, and look at your awesome felt pencil! If you want, you can just glue stuff onto the front side, but I decided to do the back as well. The surprises I'm putting in the pouches for the boys are a little notebook, pencil, fruit snacks, and a car. Or instead of using them for surprises, you could use it as an actual pencil case, or BOTH!!! And I made a special big one for Daddy that I'm going to put some goodies in when he starts school in a couple weeks--to celebrate his LAST YEAR OF SCHOOL EVER!!!!!!!!!!! :):):) Yippee! I'm lovin' these pencil traditions. So glad you shared! i'm excited for the preschool ideas. i'm going to actually try & do some of them this year. yay for the last year of school ever!! Those are so FUN! Thanks so much, I'll be linking.